“Educational programming” for children under two is not educational at all. In fact, research has shown that there is some negative results from a child under two watching television. I know! That isn’t a popular thing to say. But television under two is not for you. This says that not only is watching TV–even “educational” TV–is not only not good, but potentially bad. And this statistic literally sent my eyebrows straight up. The average 12 month old gets 1-2 a day. So with these negative effects, what is it about the TV that makes parents choose to allow their child to watch TV anyway? I am sure some “just don’t buy it” and think it can’t possibly harm. I am sure some are unaware. I am sure some feel they need the TV to give them time to themselves–even if it is just to shower and brush their teeth. My children have never been big TV watchers prior to age two. I purposefully limit it (and ban it), but I also just couldn’t fit it in my day if I wanted to. Okay, I guess I could cut something out for TV if it was a priority to me. But we don’t ever need it. Naps, mealtimes, independent playtime, family time…it seems hard enough to get that time in with baby without adding television to our day. I can see it being a tempting crutch once baby went to one nap a day and was awake longer. All of my children have seen a television show before age two. Brayden saw it earliest, then Kaitlyn, then McKenna. With Brayden I did what just naturally felt right. He started watching TV when I was pregnant with Kaitlyn and he was down to one nap. I needed that 30 minutes a day to just sit still. I sat by him on the couch. But by the time McKenna came along, I had formed a more solid opinion that TV was not only unnecessary, but even not good. She didn’t really watch TV until after she turned two, and didn’t start any sort of consistency with TV until she was about 2.75 (winter time for us). I still don’t let her watch it every day. She is, however, at a point where there is learning to be had from educational programming. I encourage you to read the article and encourage you to limit if not totally banish TV for the first two years. I am not saying forever (unless you want to, that is fine). Just the first two years. After that, there is learning that happens. 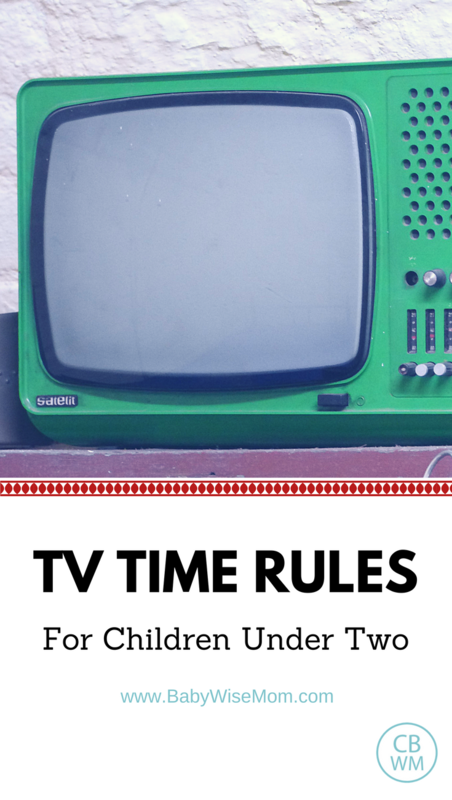 What are your TV rules in your home? My 13-month-old doesn't get any TV time now and we don't intend to allow it anytime soon. It's just not necessary. She can entertain herself with toys just fine if we need to do something else for a little while. I find that 30 minutes a day of Baby Signing Time for my 15 month old is actually very beneficial. The only TV show she watches (and it's on DVD) is Baby Signing Time… She LOVES it… asks for it multiple times a day- and her vocabulary has increased ten-fold since we started having her watch it.I disagree that children under 2 cannot learn from television. My baby doesn't do well with self-calming. I have to be with her almost constantly. The TV is usually on for a short time in the morning when she isn't content on her own I need to eat something quickly. The TV, however, isn't what entertains her. It's more me bouncing and singing along that distracts her long enough for me to eat. If the TV is on during the day, we are playing and dancing together. There is no way my baby will even stay calm enough to watch it, so I have to be there to help entertain her. Also, she never falls asleep in front of the TV. When your baby needs constant attention sometimes you need a little help to survive. As far as development goes, her pediatrician says she is ahead of most babies. By all means, I am not saying set your child in front of a TV for thirty minutes a day or anything, just that each child is different and all our situations are different, so a little TV doesn't make you a bad parent. If you do have a baby like mine that won't do independent play, yet, you can't give up either. You have to keep working at it, because your baby will get there–it takes time, patience, and a lot of effort on very little sleep. I gotta say I LOOOOOOOOOOOVE our TV. I'm not embarrassed to admit it 🙂 My 3.5 yr old watches probably 1-2 hours a day, depending on the day of the week (I'm sure it eeks past 3 hours on weekends). M-Th she's in preschool from 9-12, then nap, then she'll get some TV between 4-7:30, usually when I'm prepping dinner. My other child is 11 months old. I can actually I would never let him "watch" TV as a baby can't really interpret what they're seeing. However, if both of my children are awake, and my daughter is watching TV, then my son is going to be watching it, too as he plays because they're in the same room where I can watch both of them. My daughter didn't really sit still enough to watch TV consistently until she was well over two, anyway. I know this is totally anecdotal, but my husband, who is Ivy league educated, watched enormous amounts of TV as a child (per his mother), and my husband's maternal grandmother insists her children watched TV all the time and 3 of the 4 of them are highly educated, calm, and normal adults. I think we all need to do the best we can, and frankly as mothers I think we all have different needs and personalities. Could I be reading Olive more books? Sure. But I don't really like reading kids books, and when she talks to me about cylinders and cubes and pyramids and dentists visits and colors and I know she picked all of that up on Mickey Mouse Clubhouse or Sesame Street, I become so grateful that at least what she watches is high quality, that people with advanced degrees are spending their lives trying to figure out what is beneficial to children, and in my opinion doing a brilliant job. I think that next to me, the TV has taught Olive the most valuable information she knows. Lastly, Olive only watches stuff from the DVR, and only for a set amount of time. The TV is never on for background noise and I don't really allow my husband and daughter in the same room if my husband is watching TV. If Olive is in the room and the TV is on, the TV is on for her. I am extremely careful about what she is exposed to. Quite admittedly, my problem is with "background noise". My 9 month old never watches or pays attention to the tv, but I regularly have it on so that it isn't quite. It's a habit that I'm trying to break. As a teacher, I could always tell which students grew up watching lots of TV and which students' parents limited it. I even did a survey halfway through the year each year, asking my kids to list all the TV shows they watched. Sure enough, I was spot on 98% of the time when guessing (based on academic performance, behavior, and attention span) which kids watched more than 1 hour a day and which kids watched none.I had seen this research prior to my daughter's birth, and I agree wholeheartedly that TV is a totally unnecessary use of a child's time- there is so much NONeducation that occurs when children watch TV. I know my family is a bit extreme, but the only time my daughter (20 months) has seen any type of "show" has been on my phone at the doctor's office, for a 2-3 minute Elmo clip or one time when she was super sick and we watched 5 minutes of a "Word World" video. Our family even sold our TVs at our garage sale last summer. We don't watch TV really (my husband and I will borrow a TV series from the library and watch it on the computer after bedtime sometimes), and so we just used the money to buy some toys and craft supplies, which in my opinion is a much better investment. :)Also, I'd like to caution folks once again to look at the actual research for themselves instead of just reading someone's summary. Valerie included a lot of great info, but there is even more out there that would really make anyone think twice (or thrice!) about TV (and screens in general) under 2. It is irresponsible in my opinion to have the knowledge in your head and at your fingertips but ignore it just for sanity's sake. Think long-term for your children, who will excel in school when they have excellent focusing skills and have not been "entertained" for their entire lives. Sell the TV and use the money to hire a babysitter to take the kids to the park for an hour a day so you can get you "me time" in there if you need to! I allowed my son to watch tv for a long time because I needed a break – or so I told myself. We were scared of some developmental delays though and decided to cut it out. Completely. My daughter didn't really watch much, so why should he? The first couple days were brutal. All he wanted was tv. But then he was willing to learn to play. And I think that's key. Some kids need to be taught to play. After I taught him how he really started to blossom. Now he looks at books for down time. When we're visiting at other peoples homes he won't watch tv for long of they have it on. He's too busy playing. Kids are a lot more adaptable than we realize. If I need to sit because I'm tired, then we all sit down and read a ton of books together. Much more educational. My husband and I work – and while we get ready for work, my 21 month old watches mickey mouse clubhouse – sorry but unless someone is going to come to my house and stay with her while we get ready for work, then, that is what we need to do. Sometimes this is just needed. SHe plays well alone but I can't watch her. WHen I put a show on, she will sit and eat her cheerios and watch tv while we get ready. We do allow some TV. My kids only watch things from DVDs, nothing on actual "TV" as I find it easier to monitor content that way.It is very closely regulated, but we do use it. We use it for entertainment only, not learning, although my 4-year-old does learn things about both the world and fantasy from watching. At his age, I do feel that small amounts of TV viewing are actually beneficial – the key is SMALL amounts, appropriate content, and varied shows. I feel it expands some of the ideas he has and his creativity.For my 1-year-old, it's mostly only used when we've had a tough day and I need to get dinner made. It's very much limited, but very helpful when we use it. I agree that if I was a perfect parent or if my husband was home from work that time of day ever, maybe there would be some way to never have any TV viewing.I think studies are great, and I have not read these studies. In general, though, I do try to remember that even the best studies are statistical analyses based on large numbers of people, and because a good study looks at such a narrow range of data and controls for so many things, it's not always as applicable to our everyday life as we'd like to think. I'm not discrediting these particular studies, but I am saying that using TV sometimes, when done with care and consideration, is appropriate. For comparison, when you go on vacation, your child might eat more fast food and sleep less than they do at home. This is bad for him, but does that mean you should NEVER go on vacation? No, vacation is enriching in other ways. It means you need to carefully consider your use of vacations, where and when and how you go, etc. I see TV use in the same light. Okay, so I've been reading through the studies that were cited in the article that Val linked to. Since this post is about children under age 2 (and one of the studies linked in the article cites that small amounts of TV viewing for kids over 2 may be beneficial), I'll just say that for kids under 2:I absolutely agree that there is NO harm in limiting or banning TV viewing for kids under age 2.But, I still think it's important to carefully read the studies in their entirety before making conclusions about what may be harmful. In the study "Early Television Exposure and Subsequent Attentional Problems in Children" which claims that early TV viewing was associated with attentional problems at age 7, the authors themselves say: "we cannot draw causal inferences from these associations. It could be that attentional problems lead to television viewing rather than vice versa. . . .It is also possible that there are characteristics associated with parents who allow their children to watch excessive amounts of television that accounts for the relationship between television viewing and attentional problems. For example, parents who were distracted, neglectful, or otherwise preoccupied might have allowed their children to watch excessive amounts of television in addition to having created a household environment that promoted the development of attentional problems"This is a REALLY important point to remember when interpreting the results drawn in this study. I am definitely NOT promoting TV use for children under 2, just saying that it's important to read these studies carefully, not just rest on "studies say…" as a definitive answer to all questions. Like Chelsea, I think my son did learn signs from Baby Signing Time before age 2, and it was watching it a few times a week that kicked his signing into action. But, I would hold him on my lap and move his hands to do the signs and we would only watch a few times to not at all each week, and that was the only program he watched. Like Val, I think you just have to be really careful about how much time you allow and what programs. I think children under 2 should not watch even half an hour each day, only on a limited basis and it's still good to limit TV to only a half hour a day or less even after age 2. This is such a frustrating topic. I do not "ban" my young children from seeing tv and do let them watch shows throughout the week for a variety of reasons. SO many of my friends killed themselves to make sure their children never laid eyes on a tv program, whereas I was more laid back. Do I use the tv instead of spending time with my kids? Certainly not. Do I use it when I need to distract them at times. Of course. I think where people go wrong is using it ALL THE TIME. I still spend the majority of my day interacting with my kids so I have a really hard time believing a small amount of tv is going to hurt them. IN the case of my first son, his vocabulary is WELL BEYOND every single one of his friends and he spoke months before the rest of them that never saw tv before. I think every family needs to be mindful of the amount of tv their kids get, but I personally don't think it's necessary to ban it altogether. I appreciate this post though because I think too many people get carried away with tv being bad and few have actually read the research. I agree with the commenters above about Signing Time. My kids had TV time before age two (I won't defend or excuse this except to say that it was right for our family's circumstances) and Signing Time DEFINITELY helped their language skills grow in leaps and bounds.I am very strict about what my children watch (the book NurtureShock provides some fascinating research on the social effects of "educational" PBS programs on preschoolers and kindergartners), and TV time is a part of our structured day. We keep our TV in the basement, though, so that all of our screen time as a family is deliberate and dedicated. We do not use the TV as background noise, and we as parents never watch TV while the children are awake.One other note on this subject: we need to be skeptical regarding science journalism and the results of scientific studies. I think we all know that a lot of TV for kids isn't great, but is it TV before age two that is the cause of developmental delays, or are both the symptoms of other more serious parenting problems? Our decisions about screen time are just one of the many, many decisions we make as parents that affect our children. I just visited a family in the US (we live in Europe) and was shocked at the amount of TV the kids (and the family) watches. They were all over 2, but still. I can't even grasp how a toddler can spend 2 hours in front of the TV!! We don't have a TV and only watch DVD's in the evening on the computer. I think it's great to live your life without a TV. You get to be more creative in how you spend your time. I would recommend to everyone to re-think having a TV (or how you use it). It's like fast-food: instant gratification, but what about the long-term effects if you have it all the time. Of course, if the parent is still in charge (say like 30min of TV time for older kids planned in the schedule), I think it's still fine. I just saw how the TV was used whenever the kids were whiny or because the parents couldn't be bothered to play (or the kids said they were bored)… those uses of the TV are (in my opinion) horrible. I am so happy that studies are now coming out claiming that TV is not educational for under twos; this has been my gut feeling just from watching my nieces watch TV – I can just see them "check out" mentally which is so sad to see in a very young child. Someone lent me a collection of Baby Einstein DVDs which she raved about. I put them on a couple of times and really didn't like them and didn't see how they could possibly be good. We have a TV but no actual TV connection which makes it very easy to avoid TV. We use it to watch movies and DVDs in the evenings and we even have rules about when *we* watch TV because we can feel it sap energy and steal precious time. Mon, Tues and Wed are strictly Tv free for us. Our boy is nearly 11 months old and would probably be exposed to TV about 4 hours a month. I won't put the TV on for him, but I do catch up with some friends once or twice a month for some TV viewing and gossip, and it suits my sleep best to do it in the afternoon rather than the evening after bubs has gone to bed. I do worry that it is affecting his playtime -he certainly doesn't watch it for long, preferring to play and interact with us – but I figure that it is a small amount and the best way for me to still have some social time. Most of all I'm happy to be able to point grandparents to the research so that they stop trying to convince us that TV would be good for him and we should get it connected. Thanks everyone for your thoughts and comments. Lots of interesting and divers opinions on the topic! Trevino Family, You know, I think you have to just do what you are comfortable with. Like I said in the post, all of my children did see some TV before age two, but I also severely decreased it with each child until McKenna. She saw very little. You can't say what impact it did or didn't have. I can't look at who they are vs. who they would be without any of that television. They are all smart and all have good attention spans. I will say that from my observations, McKenna seems to be the least impacted by television, and she saw it latest and fewest–she has less of a tendency to get addicted to the TV. Long story short, just go with what you feel comfortable with. Stan and Becky,I really like your comment because it pulls out something I have observed in my years of being a parent. That is that children get addicted to television (and really adults do, too). And you think you really need that TV time for whatever reason.But then when you do take it away, the child goes through withdrawls, and then, the child plays so well and never asks for the TV. Thanks for sharing your thoughts. Katie I appreciate your thoughts. All good points to consider. I like the point of, basically, is it correlation or causation? Is it that the parents they studied that used the TV also happened to be the type to not really interact with their children? And also that leads me to, is all TV before 2 going to cause problems, or is there a certain threshold where it becomes a problem–or are there things parents do to basically counteract the problems (like if the parent also happened to be a big story reader to the kids)? I don't know.I will say this research is very easy for me to believe based on what I have observed as a parent for the last 7 years. Like I said n my post, Brayden saw his first TV around 15 months old. Kaitlyn was a little older than that, and McKenna was 20-something months old. Not because of any research I had read or anything–it was a conclusion I had drawn on my own just from see the effects of TV on my kids. I figured there was no reason for McKenna to see TV before that.I pretty much ban TV/any screen if the weather is nice outside. In January and February, the kids watch the most TV. I don't allow them to even watch it daily, though. It quickly becomes an addiction, then an obsession, then they don't want to do anything else, then the bickering starts, then the obedience levels drops…I have watched the cycle enough times to know the effects are real. And we only watch shows I deem quality and that have zero commercials. I also liked your point about going on vacation and eating less-healthy food, and I agree with that. However, when we go on vacation, I make sure to pack a lot of fruits and vegetables and healthy snacks so that we aren't just depending on fast food or even restaurant food because I know how it makes you feel over time. So to carry the analogy forward, I am pregnant right now. I am super sick and super tired. No one would blame me if I let my kids watch more TV than usual, and certainly not 30-60 minutes a day. This could be compared to "the vacation. "However, I am convinced enough that TV has negative impact that they do not get to watch TV every day, even if it would mean a cleaner and quieter house. Even if we are "on vacation," I want there to be healthy choices available.Anyway, hopefully that all made sense. I appreciate your points! Great thoughts. Melissa M,Oh I just ordered Nurture Shock. I randomly saw it on Amazon and thought it looked interesting, so I am glad you referred to it. I am interested to read it.We also have our TV in the basement–I definitely think that helps prevent the kids (and parents) from having it on all the time. 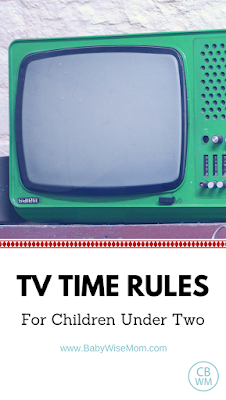 So since I asked you all what your TV rules are, I thought I would briefly share ours. Since I have no child under two, it doesn't apply to that age group. My children are 6, 4, and 2 but all almost 7, 5, and 3. 1-When the weather is nice, no TV.2-When we do watch TV, it is 30-60 minutes.3-No TV on Sunday4-We do not watch TV every day–I try to make sure we don't watch two days in a row ever, but sometimes that happens.5-Homework, chores, piano practice, etc. need to be done before you can watch TVThat is basically it. I was thinking I should also add…there are days that my kids do watch more than 1 hour–and sometimes we watch a movie as a family that is longer than an hour. If I had the flu one day, I might let more TV than normal, but for something like a pregnancy where I am sick for 9 months, I could justify it, but we would all pay for it at some point 🙂 Typically I find that just like "sleep begets sleep"–"TV begets desire for TV." Finally, because of this blog post, I've been thinking about our TV usage. I've been wondering if we use it too much, and I've been thinking if my daughter is addicted to it. So, yesterday when she got up from her nap (when we usually cuddle and watch a show) my daughter said, "I want to watch a show." I said, "No, lets just play in your room for a bit," and she said, "Okay." Not exactly "addict-like" behavior. I do not think Val made assumptions about other parents and their choices in this post in any way, shape, or form, but I do think we as mothers consistently judge other mothers and their choices. I don't know if it's a cultural thing or what. Sometimes I think that because we don't have to get up at 5 am to milk cows, hand wash everyone's laundry, and bake bread before 9 am, we have more time on our hands to simply feel guilty, and in order to assuage that guilt, we look to criticize (usually in our minds) other mothers. In my reevaluation of our TV habits, I am now more resolute in it's incredibleness. I truly love it, and I'm truly glad I live in a time when it's available. I love that it has absolutely taught my daughter things, I love that it has not effected her attention abilities in school in church nor her behavior or obedience towards me. It's a wonderful tool, and one of many I'm proud to have in my parenting tool box. We don't allow TV time for our son who is 31mo now. We made it a rule that we weren't going to do it under 2 years, and we have just kept it up. It is actually kind of nice as we don't have the constant noise and distraction of it in our home. My husband and I are not much of TV watchers ourselves so it doesn't really change our lifestyle much at all by doing this. Many people always ask what I do with my son all day, and it is pretty simple. We play, read, chores, color, you name it. He is happy to play by himself even if I am there. He has not expectations of watching TV. I will say I have been tempted with our new baby (now 4mo) to have our oldest watch an educational show if I need to be busy with the baby, but I always go back to my original thought on it, which is why??? What is he going to get out of it that he doesn't get working on a lacing puzzle or lacing beads or blocks or coloring or what not? In my opinion, not much unless I am there with him going through the educational aspects of it. So we just haven't done it, but I don't think that after 2 is necessarily bad but still isn't necessary. Honestly, I've never given it thought. I grew up with basic TV, and watched PBS my entire child hood. I think my DH watched basic TV too. Our son is only 3 months old but we have already had the TV talk. The basic conclusion is ALL things in moderation, my DH and I are outdoorsy people so I am not too worried about it. I am more concerned with what they are being exposed to rather than how much TV time. DH and I DVR our select programs we watch and then watch them when Jax goes to bed. I also love to watch 'Live with Kelly' in the mornings (which is usually when Jax is breastfeeding. When he gets older I will most likely allow TV time, probably PBS shows like Sesame Street. Where we can learn songs together and sing them through out the day (one of my fondest memories is this with my dad). The thing that we know we will be major sticklers on is Video Games. My husband loves video games but his parents were very strict on what he played. That will be thoroughly regulated. Honestly, I think balance, moderation and common sense is key. If you feel convicted or have a little guilty conscious then you will know it's time to cut back on the TV. I agree with previous commenters regarding signing time dvd's. My daughter started watching them around 13 months. She doesnt watch them for hours on end. She is now two and her vocabulary is incredible. In addition, her ability to communicate with me is, in my opinion, the primary reason we don't have as many tantrums as other children her age. She is by no means perfect, but we are typically able to "sign through" a tantrum and figure out the cause. I wouldn't change it for the world. Natalie, I think it is commendable that you analyzed your TV time. I do think some kds are more impacted by TV than others. I know Brayden always has been pretty strongly impacted by TV and other media. My girls don't seem so impacted. Thanks everyon else for sharing your comments!